St. Patrick's Day What are the benefits of Invisalign®? Braces aren’t just for kids. Many grownups are taking advantage of orthodontic treatment and having their teeth straightened at a later age. Sometimes, patients include adults who already had braces in the past, but their teeth shifted over time once they stopped wearing their retainers. In other cases, adults who have never had braces are tired of having crooked teeth and ready to invest in a beautiful smile. Whatever the case may be, if you’re looking to straighten your teeth with braces, Dr. Matthew Fortna would love to help you with this process. Having a dazzling smile can increase your confidence in all areas of your life! Depending on what you’re willing to spend and how quickly you would like to complete the process, you have various options for getting braces. We all know what traditional metal braces look like. This is a less-expensive route for individuals who have severely crooked or displaced teeth. However, many adults avoid option because the braces are noticeable or distracting in a professional atmosphere. For people concerned about aesthetics, clear ceramic braces may be a preferable option. This type can still fix extremely crooked teeth or jaw alignment issues. It may be slightly more expensive than traditional metal braces. Patients who choose this treatment route need to be careful not to stain the clear adhesives by drinking too much coffee, red wine, soda, or other beverages that can discolor teeth. Another great option for adults who don’t want to have visible braces is a clear aligner treatment known as Invisalign®. This popular option differs from traditional braces by featuring a series of clear aligners that are each custom-made for your teeth. The entire process can take anywhere from three to 18 months to straighten your teeth completely. This may not be the best choice for patients who have an overcrowded mouth or extreme bite issues. Invisalign is often the most expensive option, but it’s great if you’re concerned about your appearance while your teeth are being straightened. If you’ve been thinking about straightening your teeth with the help of braces, don’t hesitate to contact our Fredonia office to set up a consultation. From there, Dr. Matthew Fortna can figure out the best course of treatment, depending on your budget and overall needs. 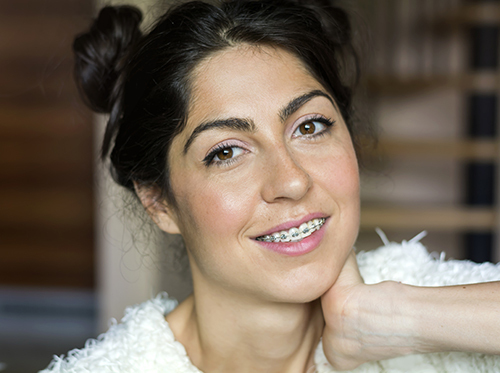 Adult braces can be a great way to boost your confidence and finally give you the smile you’ve always wanted.